The results are practically identical for the few searches I did on Caffeine. It's hard to say what has changed. When I tried to go there, it said the site was down. Googled a search across a specific site using Caffeine and current release; Caffeine only returned 3 entries while current release found 23. The latter is the correct number. Will this give me a heart attack the way Redbull will? 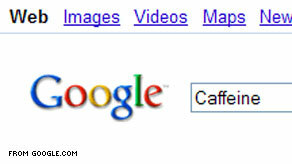 It also sounds like Caffiene is goinng to behave more like Cuil.com Which was created be a former Google employee. The Caffiene Sandbox is currently down, but I will try it later. According to Google at SES in San Jose last week, the majority of the changes is the infrastructer, now the search engine indexes the web. There is little changes to way rankings are done. Google regularly updates and tweaks their algo. I don't why this is news and other updates, like the vince update in March which did affect many major brand rankings is not news. I think that the texture of both of these cocoa – flavored rice cereals makes them fun to eat. Water flushes out the toxins the body produces as it burns fat and it gets rid of excess sodium in the system.